Lovely form in trot, with a nice stretch in the neck bringing the back up. The hind leg is well engaged, he's soft through the left rib cage, and his inner ear and eye are trained on me. I’ve never worked a horse in a round pen before. It’s not that I thought it was hooey or something, I’ve just never needed to. And honestly, a lot of the round penning I had seen looked like a great deal of running the horse around for a long time on a small circle, and that I didn’t care for. It didn’t look good for their legs. But at a more basic level, with all the horses I’ve started, I’ve had my technique and it has worked for me. The Fjord horses I work with are, by nature, pretty low-fear, high-intelligence animals. 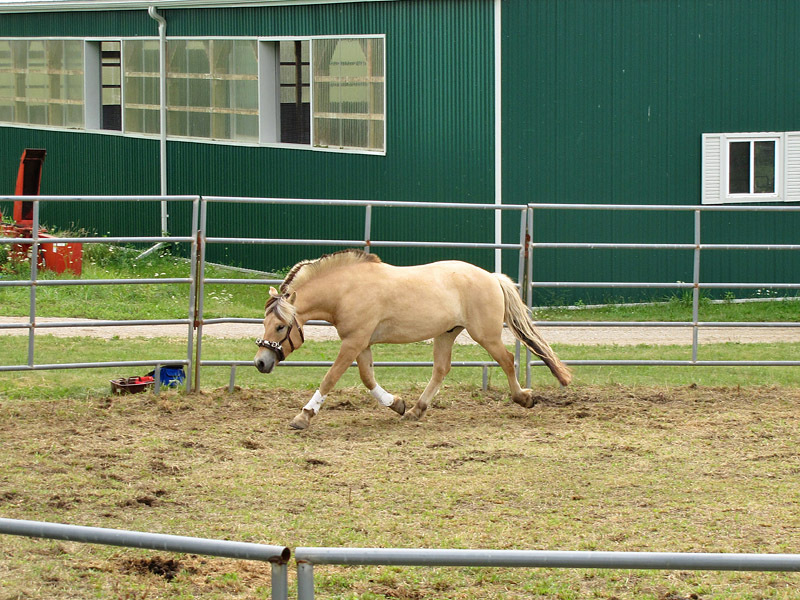 I start by teaching them to lunge in my indoor arena, and they easily pick the concept up in a day or two. I start in a leather lungeing cavessson, and they quickly grasp the idea of going forward on the circle, and letting me control the diameter with the lunge line. They soon graduate to wearing a bridle and surcingle, and then get used to wearing normal tack while going in all three gaits, and into the contact of the sidereins. Generally, within a week or two, I am on their back. It’s simple. But recently I’ve started working with a new young Fjord horse whose needs have taken me in a rather different direction. This time, into the round pen. I know I’m not the only dressage or sport rider to go there. I understand the eventing powerhouse O’Connors, as an example, start all their young horses in a round pen. But, it’s been an interesting experience for me, and I wanted to share my story, and what I’ve learned so far. This young gelding is sweet and people-loving in and around the barn, respectful and smart as can be, co-operative and not fearful of learning new stuff. But some unknown event in his past comes to his mind in certain situations when you have him in the arena. It seems to be triggered by tiny little things which I haven’t totally pieced together, but when it happens he looks like he thinks you’re really mad at him, and he just has to get away! I had the feeling that no matter what headgear he had on, or if I had the strength of a John Deere tractor at that moment, I still couldn’t hold him. His reaction wasn’t a contemptuous “Ha-ha look what I can do!” bolt; rather, a pure adrenalin-fueled need to get-out-of-Dodge. Once this happened a couple times, I could see that a round pen would come in real handy. I knew that I needed a tool that would allow me to keep this horse within my sphere of influence once he got scared and felt that he had to get out of my immediate vicinity. Luckily, my neighbors a couple of miles down the road have a nice little boarding stable, the facilities of which include a 60 foot round pen with sand footing and 6 foot high panels. The round pen was overgrown with grass and weeds, but they agreed to mow it down so that I could use it. In the meantime, I worked with the horse in my barn. With him on the cross-ties I would rub him all over with a whip, lead shank, towels, flapped saddle pads over and around him, moved the whip around his head and sides until I was all but doing the Y-M-C-A. Throughout this, he stood looking slightly bored and bemused, with a people-are-just-weird expression on his face. I asked him to enter our metal-pipe washrack: no problem. He learned to stand and be hosed within a few easy lessons. Trailer-loading: check, without a worry! A friend gave me some advice, which I found echoed in Sallie Walrond’s excellent book Breaking a Horse to Harness, to introduce him to the concept of lungeing in a large box stall. So into a 12′ X 16′ foaling stall we went, with a halter and leadshank and 4′ in-hand whip, and I had him lungeing around me both ways in walk, soft and easy. So! Whatever the problem is, it’s only being triggered out in a bigger training space. Before our first round-pen session I decided I wasn’t going to try to emulate any Natural Horsemanship teacher and do some sort of trade-marked join-up technique. Instead, I would just be myself, and use my usual training approach and tack. 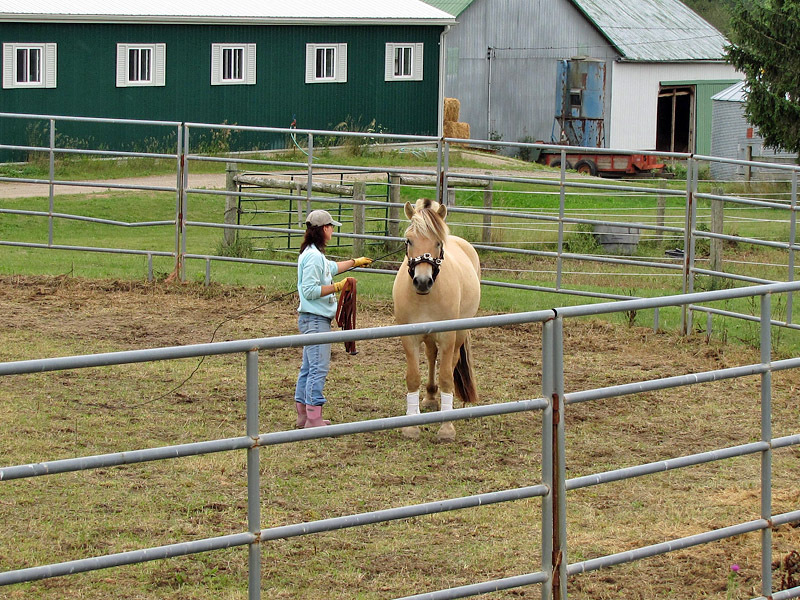 I wanted to use the round-pen as a tool to show the horse what I wanted him to do, that he needed to accept my influence, and that I wasn’t going to hurt him. I put on the leather lungeing cavesson, hooked up the lunge line, had my lunge whip under my arm, stepped back into driving position behind his girth, and asked him to walk on to the left (I knew from the stall that left was his easier way). Immediately, the you’re-mad-at-me look appeared on his face, and away he went. I let the lunge line out, and thankfully the sides of the round pen contained his dash. After a while, he settled into a trot around me, and to anyone looking on, it looked like a pretty darn routine lungeing session. Except, I couldn’t get near him. When I asked him to walk he dropped back easily, but when I gradually coiled the lunge line, approaching his girth area with a voice command of “And,… whoa”, intending him to stop on his circle, facing forward and letting me approach his side, he trotted off. But the round pen kept containing him, so I would lunge him in trot for a while, and then ask again for walk, then ask for whoa, facing forward. This was the scary part for him, and he kept saying “No can do!” So, trot on again. Repeat. Repeat. Repeat. Two and a half hours later, he did it! He came to a halt, facing forward, stayed standing, let me come up to his side, and let me rub him all over with the whip and the coiled-up lunge line. I asked him to step with me into the center of the circle and he tensed up and widened his eyes, but then he thought better of it, relaxed, and came with me. I untacked him and rubbed him down. Sweet relief! I had made the mistake of wearing a new pair of leather Blundstones (my old pair having finally given up after seven years of hard use). The new pair was two weeks old, but wasn’t really broken in, as it turns out. Somewhere during the first hour in the round pen, my feet began to whimper. Gradually, as the time went by, they upped it to a pretty constant scream. Eventually, I was in the middle of the pen with tears streaming down my face, and a horse going round and round and round with no indication that he would ever stop. At one point I thought I would kick off the boots and keep going in socks. But that’s no good, I thought, if the horse ever does stop and let me near him, I will be worried about my feet and he will pick up on that tension. So, I soldiered on through my own dark night of the soul, consoling myself with the thought that every great artist has to suffer for his art. Later, in addition to the ubiquitous foot ache, I was to find my right ankle bloodied and open, and a little toe doubled in size from a fluid filled blister. Well, I limped around for a week, but by George, the horse stopped and let me rub him! Quiet walk on the rail to the right. I ask him to whoa, and he stops and stands facing forward. Notice that he’s brought himself in from the rail. He still gets claustrophobic when he’s between me and the rail. This has already improved since the photos were taken. I want him to stand facing forward and allow me to approach. Here I am rubbing the whip on his croup while he stands. This shows a big progression in trust. 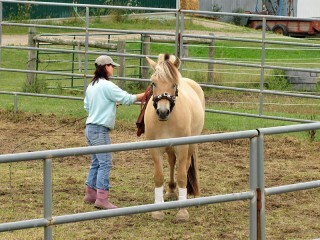 I continue to desensitize him with touching all over, now with the lunge line. More desensitization. Then, I’ll step back and ask him to quietly “walk on” straight ahead on his circle. We’ve been spending a lot of time on these simple walk-halt transitions. The next day, we did a forty-minute session, in which he came to a halt four times, let me approach and rub him with whip and lunge line, and let me move him on again. What a difference! On this day, I started adding some clicker-training-like positive reinforcement with small carrot pieces and a G’Boy! as my marker sound. When he halted straight on the circle, let me approach and touch him all over, then I would say G’Boy and reward him with a piece of carrot. When, after a few days, he started getting pushy and nippy about his carrot treats, I made a sound of displeasure and gave him a bop on the nose. He accepted this as a fair correction without taking offense. What a big step! He knew I was a little “mad at him” but he knew why, and he also knew that it wasn’t a reason for him to need to get away from me. Each day has brought so much more progress, and never any repeat of the two and half hour initial session. I’ve began working him about half on the lunge line and half off, as I found that to the right he was more scared with the lunge line on, and I also discovered I could do quite a lot without it. As I drive the two miles home each day, I think of ways that I can break things down into ever smaller and smaller pieces so that he can learn each little segment before putting the whole thing together into the bigger picture. I’m really having fun with this, and the horse and I are developing so much confidence in each other. You know that feeling you get when you’re riding, like when you’re cantering and you firm up your abs to slow the swing of your hips, and your horse immediately brings his canter more onto the spot but keeps jumping actively with his hind legs, and your soul just kind of starts to sing? It feels like you’re playing the horse like a well-tuned instrument. But no, that’s not quite it either, it’s more like you and the horse are both musicians, both playing and feeding off the other’s energy, reacting to it, and being inspired by the other to bring forth your next note. Well, I was surprised to find that familiar feeling thrumming up my spine a few times out there in the round pen! I guess I didn’t expect this work to be so gratifying, but as I experiment with slight subtle shifts of my own posture on the ground and watch the results mirrored in the positioning of, say, his hips or his shoulders, I’m discovering another level of cool in the horse-human relationship. I love the round pen for Fjords, but if you watch any of the Natural Horsemanship info, you’ll find a lot of stuff just works differently for the Fjord. Its so important to keep in mind that it is just a tool and it needs to be adapted to each horse. Also, what you mentioned about breaking things down into the smallest possible increments is important. Sometimes the tool just makes that a little easier to do. If it makes things safer for the horse and handler, that’s what is important. Lori. I use Clinton Anderson’s round pen technique (on 3 Fjords so far) and it really works. It gets the horse respect and trust and gets them thinking. The technique varies a little as to temperament, and like horses in general, you learn something knew with each horse/Fjord. 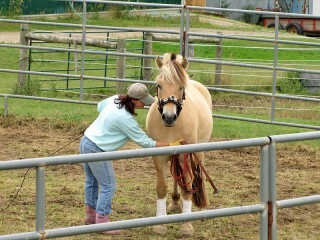 The method doesn’t just go around in circles which I agree can be hard on the horse. There is a lot of change in direction which gets the horse thinking instead of reacting. I have kept my sessions short to about a half hour. 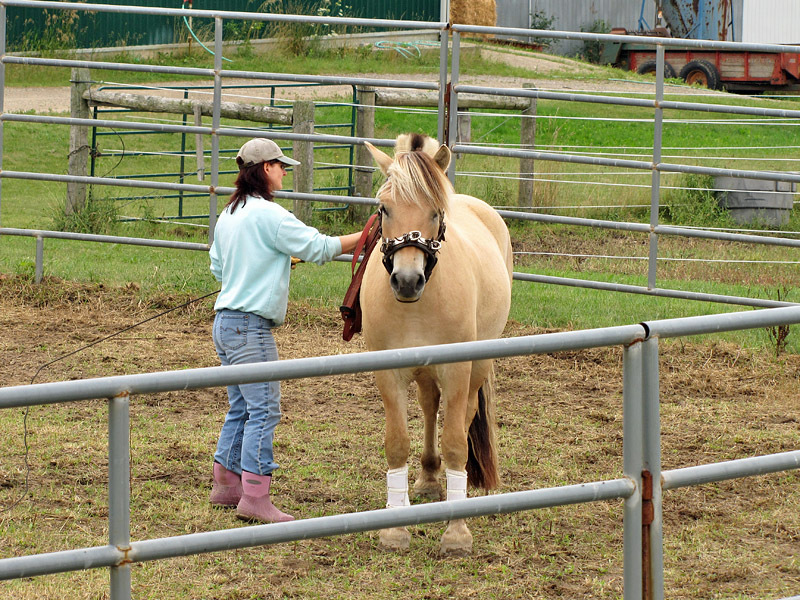 The horses learn very quickly and treats help a lot too to speed up the learning. I enjoyed this weeks articles. I love working my horses in the round pen. Peri is so well trained that she should be in the middle guiding me around. Thanks to you. Your garden looks great.It’s been a challenge this year for our garden as we are still in a drought. I love yoga but committing to a session of weeks is hard. So might order the video. Your article reminded me of my gelding Willie. His past is still part of his present, and too often he gets frightened at things, especially if they are behind him. He had two terrible experiences that I know of and regret to this day. One was with a person I had sold him to; luckily she decided she didn’t want him. ( I always give a person an out if they end up not getting along with a horse) The other incident was with a trainer who had always been my rock when teaching a horse to drive. However, this time he gave Willie too much credit for being calm and relaxed, and he hooked him to a cart too soon. Willie ran in the arena for about 30 minutes with the cart banging against the sides of the arena. No one could stop him. Your article has given me some encouragement to not give up but to move at a snails pace with Willie and try again. He is a lovely horse on the ground and adores people. Thanks for your articles. They’re so helpful! Thanks all for the comments. I’ve always believed there are many roads to Rome, and I want to be open to finding the best way for each horse, to engage him in the training process so he wants to learn and feels comfortable with me. Thanks to everyone who has given me feedback and avenues to check out. I’m grateful to this horse for the opportunity to expand my knowledge.